This could probably be described as one of the most “to the point” books I’ve recently read. It’s what makes this book so valuable and memorable - you can apply these simple truths to your life and let them guide you through decisions, doubt and questions. The way you think, the way you are with others, the decisions you have to make, dealing with challenges - these simple yet profound agreements will help you find answers. If you let it, this book can give you a way to discover yourself and achieve personal freedom. The main goal of the DD Book Club is to connect, discuss and most importantly - learn, grow and take helpful, practical takeaways that can be applied to our everyday lives from anything that we read. I really enjoyed this book as it offered all of this. 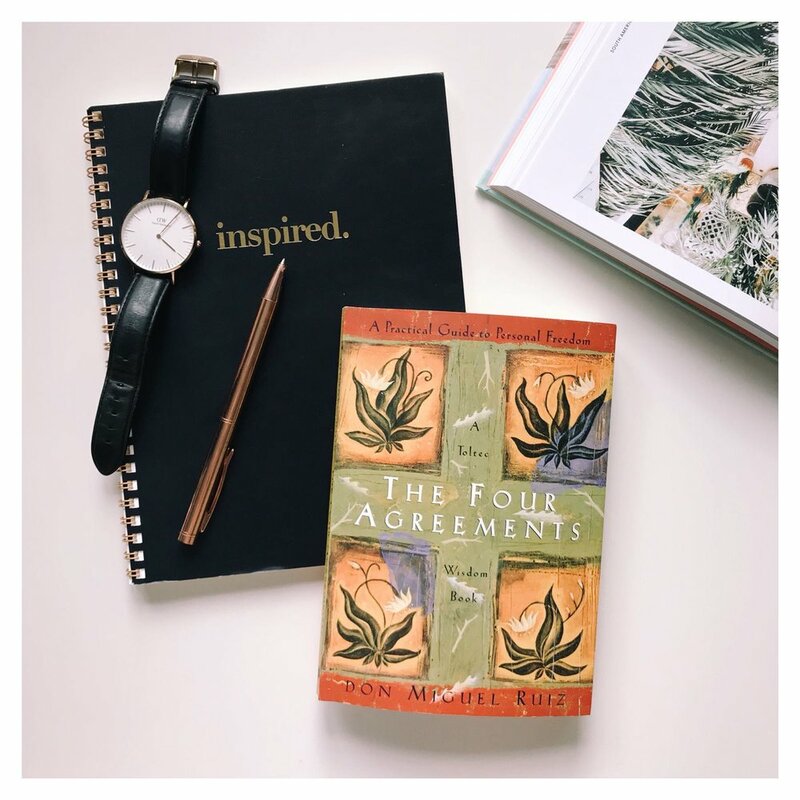 So here are my thoughts on the Four Agreements and I’m looking forward to hearing your main takeaways in the comments. Personally, my favourite agreement. This is one of the most powerful, magical gifts you can have. Words have so much power - we speak, think, express ourselves through the word. It allows us to show up, share a bit of ourselves, create relationships not only with others but with ourselves also. Our words create emotions - happiness, sadness, confusion, anger. Words have the power to change lives. They allow us to learn, grow and create ourselves. The words you feed your mind will determine how you think, the way you are acting, the ideas you have and how you communicate with others. With time, as we grow, we learn what words we want to welcome into our lives and words we want to be surrounded by. Words we use with others. Our words have the power to lift someone up or make someone feel really low. It’s so important to be aware of this. I would like to think that all of us want to be a force of encouragement and support. And it can be done so easily - compliment others, when you think that someone has done or has created something good, say it out loud. When someone is confused or unsure - encourage with your words. Beautiful words will lead to beautiful actions. We can truly relate to this from our personal experience with our DD friends. We have felt so much encouragement and support from our DD friends - through comments, emails and messages that share genuine excitement about their new paper goodies or share an experience of what difference it’s made. Messages like this encourages, uplifts and inspires us to keep creating, sharing and giving back to others, so each and every one of them is appreciated SO MUCH. By speaking beautiful things we manifest beauty and create a circle of positive emotions, therefore - make great things happen. Use words for the good - to grow, to encourage, to speak up, to support, to make a positive difference. Words we use to talk to ourselves. The words we use to talk to ourselves shapes our self-respect, self-love and contentment. The relationship we have with ourselves will determine the way we live our lives. It’s the most valuable relationship we’ll ever have, as it’s the foundation that we build other relationships and connections on. It starts with self-talk. We all deal with self-doubt at times. How do you handle it? Do you use words that are positive, encouraging and hopeful? Or do you dwell on the negative and let the little demons in your head take over and drown yourself in self-pity? I’ve become (to be honest, still are continuously learning to be) more aware on both how I speak to others and also how I speak to myself. It’s one of the easiest things you can do to spread more positivity and kindness in your life. You create a happier bubble where no harming words are allowed and you don’t use them yourself. This way you create a happy, clear and content environment around you and whatever challenges you experience, this attitude will always help you navigate through it in a much healthier way. I’m sure that at some point we all have experienced someone else being rude/disrespectful. And right away we took it personally, reacted and created a bubble of horrible feelings & emotions... Got angry, upset, sad, frustrated, anxious. I loved the “nothing other people do is because of you” thought in the book. To not get affected by someone else’s negativity (and most likely personal challenges) you have to know who you are, believe and have a lot of respect for yourself. Note to self: next time I get involved into someone else’s personal drama or in a rude/disrespectful situation - count to three and remember that everyone is fighting their own battle and it has nothing to do with you (of course, that is assuming you actually haven’t been at fault and the disagreement or criticism is not being constructive :)). Now this is an agreement that will help avoid any unnecessary stress and misunderstandings. Based on our own experiences, we make assumptions of what others think as well as assume they know what we are thinking. We all see life differently and therefore act differently. It’s important to understand the why behind people’s words and actions, but it can’t be done by simply making an assumption. So what do you do to stop making assumptions and potentially causing disagreements and conflicts? You ask questions. Just imagine if you asked questions about everything that is not clear to you? No conflicts or negative emotions based on assumptions. Next time you feel frustrated with someone or stressed about an upcoming situation, ask yourself - is there something I can clarify and get answers to? Are my emotions/thoughts based on assumptions or am I basing this on facts? Sometimes, it will take a lot of courage to ask questions and it might mean we have to have uncomfortable conversations. But in the end you will know the truth and the truth is what sets you free and allows you to act with most clarity and feel less anxious. This must be my other favourite agreement that I value most. It’s the action you can take on all previous agreements. For someone who is working from home, helping to grow a business, the to-do list is never completed. There is always more you can do, more tasks to add. It creates an unhealthy attitude that doesn’t help the creativity and productivity. When your mind is restless and you always have more tasks lined up in your head, you can’t be in the moment. You can’t fully focus and, well , do your best. So I’ve learnt that having a list of actionable and realistic (and this is extremely important - make sure the tasks you include are not overwhelming for the amount of time you’ve given yourself) to-do’s for each day that you complete and tick off have magic powers when it comes to feeling like you’ve done your best, you celebrate little wins and enjoy a sense of accomplishment. I loved the thought about your best never being the same from moment to moment. It will always depend on how you’re feeling and where you are in the given situation. So don’t be harsh on yourself. There will be days when you are an absolute rockstar and then there will be days when not one thing seems to go right and you just can’t get your head around it. Overall, having “I’m going to do my best” attitude will let you live a more fulfilled and colourful life. You are better to yourself, you create better things around you and invite happier emotions. On the opposite - when you don’t do your best, you don’t allow yourself to reach your full potential and you will most likely have regrets later in your life. At the end of the day, we are the ones that have the power to give ourselves personal freedom. We take responsibility of our actions, decisions and thoughts. Define what personal freedom means to you and then you’ll have more clarity on working to achieve it. Don’t be afraid to explore and to play. You define how you want to see the world around you. P.S. This is our second book discussion and just a little reminder that after our 3rd discussion we'll be hosting a big giveaway for those who are a part of the book club and have left their thoughts in the comments for each discussion (please make sure to also leave your Insta account in the comments). Thank you so much for being here and for being a part of the Dear Diary Book Club. We're so excited to get to know you better, learn from your lessons and inspire each other. Looking forward to chatting with you in the comments.